Tasnim – Leader’s Chief of Staff Hojatoleslam Mohammad Mohammadi Golpayegani slammed some Western governments for supporting terror groups in the Middle East and said they are spreading Islamophobia to commit more crimes in the region. In a speech on Sunday, Hojatoleslam Mohammadi Golpayegani pointed to the philosophy behind the letters of Leader of the Islamic Revolution Ayatollah Seyed Ali Khamenei to the Western youth and said the second letter came after terrorist attacks in Paris in 2015 to inform the Western youth about the realities behind such attacks. The cleric made the remarks in an address to the “Dawn of Truth” conference held in Tehran to mark the anniversary of Ayatollah Khamenei’s second letter to the Western youth in 2015. 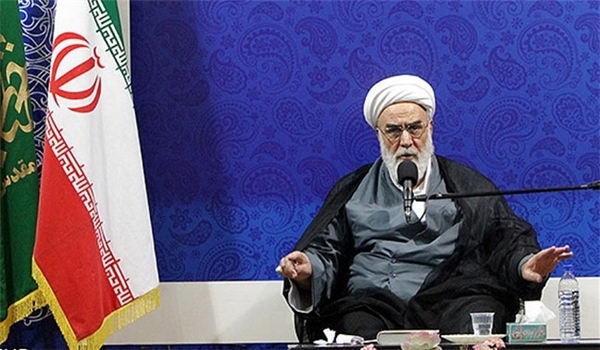 “Addressing the youth, the Leader said: ‘your governments are not telling you the truth and that the ongoing crises and crimes occurring across the world are direct results of your official’s acts’,” the cleric noted. “They want to cover up the youth and keep you, the youth, in the dark,” he added, quoting Ayatollah Khamenei as saying. “The letter raised awareness among the youth about the link between terrorism and the West’s measures and policies,” Hojatoleslam Mohammadi Golpayegani said. The letter also warned that Islamophobia is a tool in the hands of Western leaders to commit more crimes against humanity, he went on to say. Imam Khamenei first wrote a letter to youths in Europe and North America on January 21, 2015, to elaborate on the reasons behind the West’s effort to spread Islamophobia. Later on November 29, 2015, Ayatollah Khamenei sent the second letter following a series of terrorist attacks in France, elaborating on the real factors behind terrorism and asking the young people to “lay the foundation for an appropriate and honorable interaction with the Muslim world based on correct knowledge and with deep insight and by taking lessons from tragic experiences (of the past)”.